After cleaning or restoring your driveway or patio surface there is the option of sealing it with a premium grade acrylic or polyurethane driveway or patio sealer – most sealers are available as a traditional matt sealer (low sheen) or the popular gloss sealer (high sheen – wet look). These are more suited to manufactured driveway surfaces such as Pattern imprinted concrete and Block paving. There are also a number of penetrating sealer’s and natural colour enhancing invisible sealer’s available for natural surfaces and tile surfaces such as Indian Stone, York stone, etc. 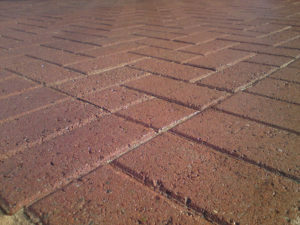 This is why it is imperative to choose the right sealer and a competent contractor for the job as putting a sealer designed for concrete block paving or pattern imprinted concrete (PIC) on some natural stone driveways or patios can have serious, sometimes irreversible adverse effects such as a yellow staining on lovely white granite blocks. If you get other driveway cleaning and sealing quotes make sure that the contractor is confident, competent and knowledgeable about the correct sealer for the job. A close up of a block paved driveway that we cleaned all the moss, weeds and dirt away with one of our specialist high powered pressure washers, then we re-applied the lost kiln dried jointing sand with new sand, then finally applied 2 coats of acrylic resin sealer for a glossy (wet look) finish… and this was all done for just under £200 for an average sized driveway.. a total refurbishment. Surfaces we can seal and reseal include pattern imprinted concrete, block paving, tarmac (back to red green or black), asphalt sealing, flags, stone sets, patio sets, sandstone, Indian stone, resin bound aggregate, bonded aggregate, York stone just to name a few. A driveway or patio sealer is a great way to protect you driveway or patio surface against stains such as oil, BBQ food stains and also are proven to prolonging the life of your investment. ***WARNING*** don’t be fooled by cowboys and fly by night companies offering a cheap, low cost driveway cleaning and sealing services, chances are the block pave or driveway sealer in question is ‘thinned down’ or maybe just joint stabilisers, you pay for what you get and if it’s too good to be true, it probably is. We are registered and approved driveway sealer installers of sealer manufacturers, details and evidence of which can be supplied on request. Your driveway sealing quote should be around £3.00 – £4.50 per metre square for a 2 coat resin acrylic sealer, £2 – £3.50 per square meter for one coat sealer application (usually on pattern imprinted concrete (PIC) driveways that were sealed less than a couple of years ago or one coat matt on blocks) and £4.50 – £6.50 per metre squared for a high grade polyurethane sealer such as resiblock. This is before the price of cleaning is added! anything well below this and you are probably getting a water based sealer which are milky white in colour when being installed or another reason for a cheap quote on a solent based sealer price is your sealer could have been thinned down with solvents such as xylene, thus reducing the solids content of the sealant. Power wash will never hard sell a sealant as we believe having a driveway, paving or patio area sealed solely for aesthetic and taste purposes (with the exception of pattern imprinted concrete which must have a sealer applied as it forms part of the structure and performance of the driveway) but there are proven benefits to having your driveway sealed, listed below, but please remember, there are no guarentees with any sealer when it comes to weeds… (no one can give a guarentee against stopping life forming! )… weeds and moss WILL grow back eventually, driveway and patio paving sealers just ‘inhibit’ weed growth. To combat this we recommend using a weed killer periodically to keep on top of problematic weeds. For moss we recommend a very easy to apply algaecide or fungicide such as ‘Patio magic’ or ‘Hero’ availible from all local supermarkets. What are the benefits of having a driveway or patio sealer applied and what are the main properties of the sealants that ‘Power Wash’ use? Please do not hesitate to contact us regarding any of our driveway, patio, Indian sand stone or block paving sealer, sealant & sealing services in and around Manchester, Wigan, Warrington, St Helens, Liverpool, Lancashire and Cheshire.